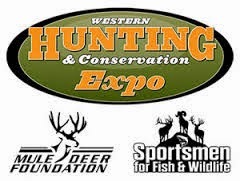 Last weekend I attended the Western Hunting and Conservation Expo in Salt Lake City which was, like always, a great time. Part of the fun this year was walking around and meeting up with a few of the people I talk with on social media to actually put a face to a user name! Along with that, I was able to meet a lot of new friends and spend time seeing the in's and out's of some amazing products. This post is going to be a synopsis of how I would gear up based solely on what I saw and experienced at the Expo this year! This section will be split into two different categories Daily Wear and Hunting Clothes. Daily Wear: I really liked a lot of the different clothing companies and it seemed like there were a lot of them this year. Some of the companies I saw and liked were Sweat n' Bulletz, Scout Outdoors, Tines Up, and ZIIS. As many people would agree, clothes are just clothes and in all reality what is on your shirt does not always reflect who you are. With that said, the people in the ZIIS booth, Scout Outdoors Booth, and Sweat n' Bulletz booth went out of their way to say hi, get to know me, and make me feel like a friend. They didn't care if I bought a shirt or hat at all, but they just wanted to know who I was and cared more about friendships than merchandise. Because of that, I would strongly recommend supporting either one of those three companies if you want to pick yourself up some cool looking clothing. Hunting Clothes: This area was by far my favorite discovery this year at the Expo. While walking around I literally almost walked right past this booth thinking it was some high end camo company that I had already seen. When I saw the Game Gear logo in the booth I quickly realized that I didn't recognize the brand so I stopped in and had a look. About 15-20 minutes later I had talked to a few of the people in the booth including Ron from Boned Out Productions who was able to fill me in on some of the great qualities of this product. Not only was I impressed with the product but the people were great and easy to talk to. Once I started looking at the prices of the gear I was blown away at how affordable it was compared to many of the other companies/brands out there. Knowing that this gear was made out here in the West for those who hunt out here, I was becoming more are more of a believer. Game Gear makes everything from base layers to cold weather gear, and even make a snow camo line that they had on display at the show. 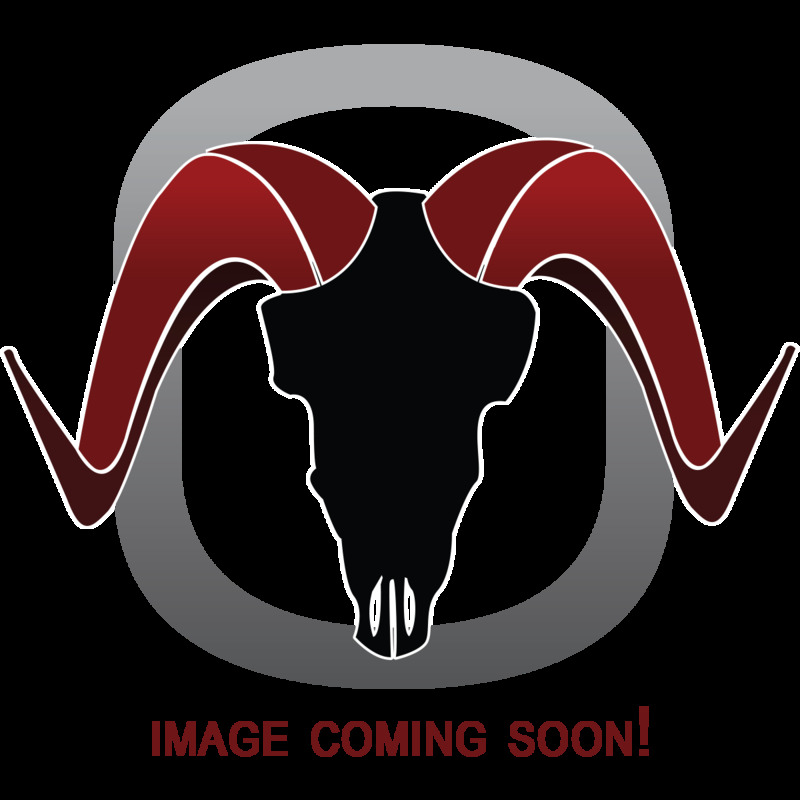 Game Gear is new to the camo business but not new to the clothing/athletic gear business. Their products are built to be used to the extreme and withhold the elements you put them through.... Plus they look pretty freakin cool! Exo Mountain Gear: I first read about this pack from Sole Adventure's blog and really liked the idea of it so when I saw their booth I had to stop in and see the in's and out's of it for myself! This pack was made specifically for hunters by hunters! As I sat there and listened/watched Lenny go through all of the different features I had read about previously I was blown away. The versatility of this pack combined with all of the different options/accessories impressed me tremendously. 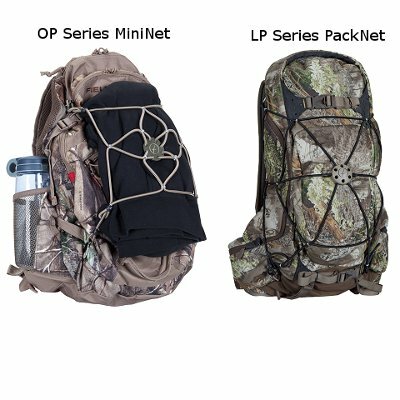 One of the concepts I liked about this pack was its design to allow you to pack for a back country trip while also being able to have all of your hunting gear easily accessible at a moments notice. This one was an easy choice for me having used Hawke Optics as well as a hand full of the other optics brands who were at the show. Hawke Optics still impresses me with the quality of glass they are able to provide while also being priced far less than their competitors. Some of the products I liked from them this year is their line of compact binos. I have used their Sapphire ED binoculars which I am writing up a review on which I will post next month, but at the show I was really excited about their compact binos. These binos were light weight, small, and powerful which is exactly what you want for back country hunts or even just to have to shave off some weight and size of your normal binos while hunting. There were a hand full of products this year which were interesting and seemed to be useful. Some of them that caught my eye were Inergy Home (solar power panals), Tribe One Outdoors (PackNet), and OnXMaps. I myself feel that you can never have to many accessories and little gadgets that make your life/hunt more convenient. I would honestly say that all three of these companies/products are worth looking into. I already use OnXMaps to scout out my hunting areas and plan out my hunts. One think I like about their product is that you can scout while at work (just don't tell your boss), at home, or any other location where you have your phone on you. With OnXMaps you are able to store maps of your hunting area so that you are still able to use the app when you are out of cell phone service. Using this on your hunts and scouting can be very beneficial. The Inergy Home solar panel is one product I am interested in due to the fact that if I use my phone or GPS with OnXMaps I want to make sure I have enough battery to use it during my whole entire hunt. The Inergy Home charger works differently than other solar panels in that they have an internal battery pack that is charged by the solar panel which then charges your device. This allows you to use your device during the day and then charge it when the sun has gone down. Also one benefit of this device is that it is 100% water proof! I was able to visit with some of the workers at the booth and see pictures of their testing on their product which was very impressive about how water proof their device really is! Tribe One Outdoors makes a "PackNet" which is a web like contraption of bungee cord that is easily attached to the outside of any pack which allows you to additional gear to your pack if needed. I really liked this product at the Expo and was quite impressed how their PackThach system allowed this product to be used on any pack that you already have. In their booth they had displayed all of their different products showing how they can be used to hold your bow or rifle onto your pack as well as used to make a simple pack capable of carrying much more gear than it would without the Tribe One PackNet or their smaller version Tribe One MiniNet. This is product allows you to increase your carrying capacity without having to add additional weight with some other form of carrying case or pack. I strongly feel that this product is simple yet innovative enough to be around for a long time. I really had a blast this year and enjoyed talking with all of the people I met. Once again this list is based off what was at the Expo this year. I feel that these products are at least worth checking out like I did then if it meets your needs I would recommend considering adding them to to your gear! I hope this helps for those of you who couldn't make it to the Expo. Let's be honest... I don't just ice fish as a coping strategy to get by when hunting season ends... I LOVE ice fishing. I've has some of my followers on social media ask me about all my "gadgets" and have made statements like, "that's a pretty fancy gadget just to catch fish". Just like hunting or any other outdoor activity, your gear can make a huge impact on your success as well as how comfortable you are. When it comes down to it, they are right to a degree. A chair is a chair, a pair of gloves are a pair of gloves, just like in hunting boots are just boots, and a bow is a bow. Where they are wrong is when assume that all chairs, boots, or bows are all made equally! This post will give you my look at the Clam Chair... yes a chair! Now before you exit out of the post because you think I'm just going to talk to you about a chair, I will let you know that the Clam Chair is MUCH more than just a chair and it can change the way you fish! Dual Purpose: The main reason this chair caught my attention was because the chair could fold up and double as a carrying case/backpack with two adjustable shoulder straps. Many of the places I fish, I often snowshoe into my spot or bum a ride from someone with a snowmobile. The Clam Chair has the capacity to easily carry all 5 of my rods (capacity says 6 rods), my 5 JawJackers, my bait, ice scoop, extra jigs, and even my lunch and some extra clothes. I always hated pulling a sled all the way across a frozen lake in the snow or dragging my sled behind someone's snowmobile and getting snow/slush all over all my gear. 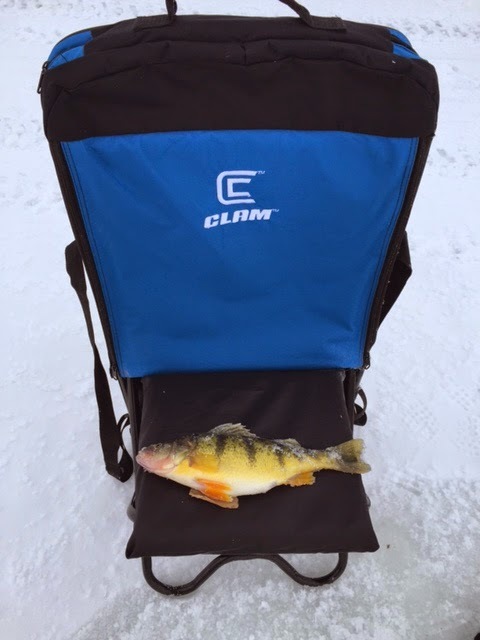 With the Clam Chair I was able to carry all of my needed gear on my back and then hold on to my auger when traveling to my fishing spot. This feature was great for mobile fishing when I would move around the lake to many different holes trying to locate fish. Functionality: The functionality is huge with this product. 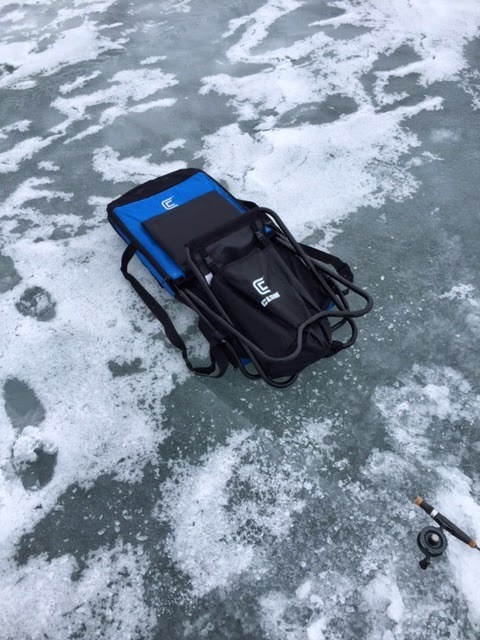 The rod storage provides a enclosed hard case that protects your rods from being damaged while also providing structure for the chair, The chair has 4 other zipper pouches and one Velcro mesh pouch, that provides ample amounts of storage for whatever gear you may need to bring with you out on the ice. On the back side of the chair, there are two quick access sleeves where you can store a rod for easy access or other gear as well as two Velcro straps that can be used to strap down other gear. Another neat feature is that when the chair is folded out, there is a padded cushion that folds down as well as a fish bag mounted under the seat. I myself use it to hold my bait or any other item I want to access without having to get out of my chair while fishing. This bag is easy to detach and can be washed if you do decide to use it as a fish bag. I love that the Clam Chair is a full size seat with back support while fishing. This chair is a lot more comfortable than sitting on a bucket or some other small chair that I would typically use while ice fishing. 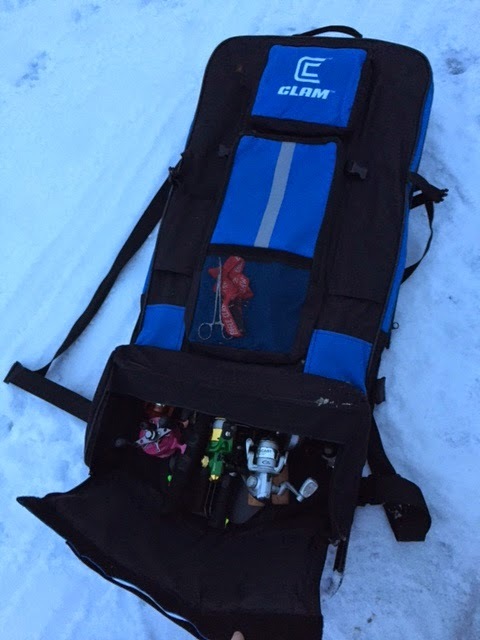 Anyone who ice fishes knows that the less gear you have to pack makes your trip a lot more enjoyable. Rather than sacrificing a comfortable seat, the Clam Chair allows you to transport all of your gear safely while also fishing in complete comfort. The chair only weighs 12 pounds which is quite light considering the hard case rod storage and metal frame for the pack and chair combined. Simplicity: I know you think I'm dumb for saying I love how simple this chair is... for heaven's sake its a chair, what would you expect... But in all seriousness, I like how every feature of this chair is designed specifically for ice fishing. There isn't a single part of this chair that I don't use nor is there any bells and whistles that are unnecessary. The more I use this chair, the more I learn to love how much thought went into each pocket and pouch. Top/Back Heavy: One thing I didn't like when using this chair at first was that some times I would stand up to check some of my other rods and the chair would fall over backwards when I wasn't sitting on it. I would have some of my gear still in the pockets of the chair which would put some weight toward to top/back so when I wasn't sitting on it, it would tip over backwards. I ended up solving this problem quite easily by making sure my chair was set up in some snow where I could pack the front legs down or by simply placing a few items in the fish bag under the seat. By adding a little (honestly not much at all) weight to the fish bag was enough to keep the chair from tipping over when I wasn't sitting in it. Stitching: This one is not a serious concern because it was resolved completely through Clam but I do feel it is important to mention... I used one of the quick access sleeves on the back of the Clam Chair to store my ice scoop, and when I was pulling it out, the top of the sleeve ripped/came un-stitched. I have had this issue with other carrying cases, shelters, and chairs in the past from other companies and I am not sure if it's just my bad luck or what. I contacted the customer service from Clam who informed me that they would warranty the chair completely and make it right. With the tear, I feel it was more of operational error than anything so I am glad they will warranty it, yet I do feel (and Clam agrees) that the product should have been able to handle a bit more before ripping. Clam warrantied the product claiming it had a weak seam that shouldn't have ripped like it did. My overall consensus on this product is that it really is much more than just another chair. I love not having to organize everything into 10 different bags or buckets and then try to fit them all into my sled like I am playing Tetris in a snow storm. Even when I use my sled, I am able to fit everything in my clam chair, put the chair in my sled, and then place my auger on top then I'm good to go. 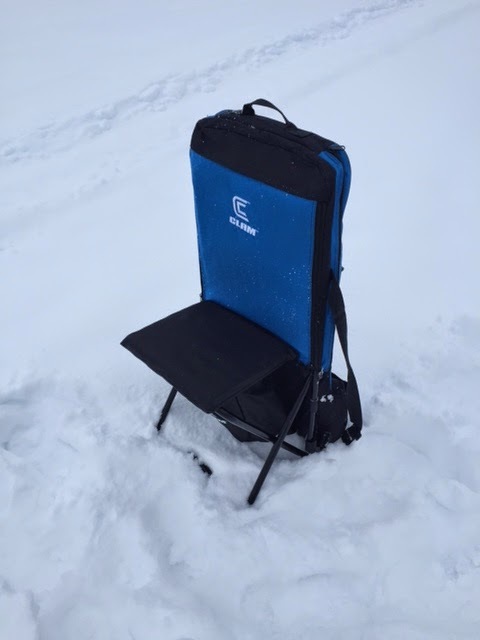 This chair has been great for me when I have snowshoed into a few of my more remote ice fishing spots and it has made snowmobile trips stress free not having to worry about my gear getting iced up or falling out of the sled. I have used more Clam products this year than any other company and have quite pleased at how all of their gear functions. I can say that what I love most about Clam is that the people working for the company know ice fishing! 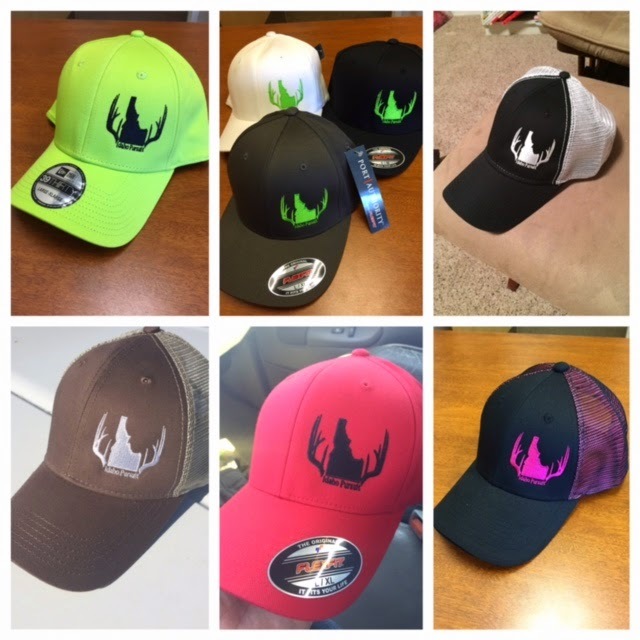 I have email and called Clam to talk about products and everyone I have talked to LOVES ice fishing and loves what they do to help out fellow ice fishermen. I have yet to have a negative experience with Clam Outdoors! You can tell a lot about a company from how they treat their customers and Clam stands behind every product they offer. As with all reviews on Idaho Pursuit, the following review is my honest opinion. I am not a pro-staff member of, sponsored by, or associated with Clam Outdoors and am not accepting any compensation, monetary or otherwise, in exchange for this review. My independent status may change in the future but, as of the date of publication, no relationship other than described above has been pursued or established. It's important for state agencies to understand and respect differing points of view. But when a few advocacy groups try to grab headlines by skewing Idaho Fish and Game scientific wolf monitoring data in ways that simply aren't true, it's also important to set the record straight. Idaho has more than 100 documented wolf packs and over 600 wolves. Idaho's wolf population far exceeds federal recovery levels of 10 breeding pairs and 100 wolves. After meeting federal recovery levels in 2002, Idaho's wolf population grew largely unchecked for the remainder of the decade, resulting in increased conflicts with other big game populations and livestock. After 4 harvest seasons since the 2011 delisting, livestock depredations have declined. Wolf predation continues to have unacceptable impacts to some elk populations, but there are signs elk populations are responding positively to wolf management. Wolves in Idaho continue to be prolific and resilient. Idaho will keep managing wolves to have a sustainable, delisted population and to reduce conflicts with people, livestock, and other big game populations. Despite these facts, a few advocacy groups chose to take the breeding pair metric out of context to make claims that Idaho wolves are "teetering on the brink of endangered status once again." That's hogwash. And it's the kind of polarizing misinformation that undermines responsible wildlife conservation and management in Idaho. Confirming a pack meets U.S. Fish and Wildlife's narrow definition of a "breeding pair" is costly and labor-intensive. With vast reductions in federal funding to the state and Nez Perce Tribe for wolf monitoring, Fish and Game has focused our effort on demonstrating Idaho has at least 15 "breeding pairs" to comply with federal recovery requirements. Idaho closely surveyed 30 packs and confirmed that 22 of them met the breeding pair standard at the end of 2014. Because Idaho has shown it is well above federal recovery levels, we may rely on less intensive monitoring for the other 70 + packs as we complete our final 2014 population estimates. One can assume these 70+ packs include some additional breeding pairs. We will publish our annual monitoring report in March. As trained scientists, Idaho Fish and Game stands by our data and our wildlife management plans. We manage wolves to ensure we keep state management authority and address conflicts with people, livestock, and other big game populations. I hope people who truly care about wildlife conservation ignore the exaggerations and misinformation and help Fish and Game focus on the real issues affecting Idaho's wildlife.